This utility developed by the guys of Login Consultants is primarily made to give the user the possible to solve most common issues within the App-V client. Without this tool you need to give the end-users access to the Application Virtualization Client MMC snap-in. Normally the MMC is too difficult to understand by the end users. Also the MMC offers much more rights that the user needs (or functions don't work because you have limited the possibilities for the end user. The App-V Self Support Tools is delivered as single executable together with XML file for the configuration settings. In this XML you can also add additional languages (by default English, French, German and Dutch are available) as described in the manual. You can also change the banner with your company logo. The utility is displayed in the tray icon, from where the user can access the features available. The application has a simple but effective graphical user interface. The utility shows the available application together with their current status (when the detailed view is chosen). Per application the user can repair, cache or start the application. Also a refresh of the App-V client can be performed. Personally I think adding the options clear and lock can be useful in some scenarios. However this utility is perfect for performing standard App-V actions by the end users. Logically the end users need to be instructed what the button exactly perform which actions and when they should run one of these options. With the release of App-V 4.5 Microsoft introduced 3 scenarios to deploy App-V 4.5. While the full infrastructure offers the most possibilities like publishing shortcuts on the workstations, it has hard to implement this in enterprise infrastructures with several locations. The streaming only scenario is easier to implement in enterprise environments, but lacks the option to publish the application shortcuts to the end users. Till know to accomplish publishing of shortcuts you could use user management software, but now TMurgent released the freeware utility App-V DeployNPublish (build for Terminal Server, but in theory you can also use it for desktops) which makes it possible to add shortcuts of App-V applications. This tool exists of two executables which should be copied to on every machine where the App-V Client runs. Also two registry keys should be created (this can be done with a script delivered within the package to automate the process of the deployment). The next step is to fill the configured OU (and if not yet done, create the OU). The OU needs to be filled with groups, where the name of the group should be named as the application folder within the content folder. Because in this freeware version it's based on package basis, all application shortcuts (OSD files) will be published in one bundle. Logically when the user is added to such a group the shortcut will be displayed as described later in this article. 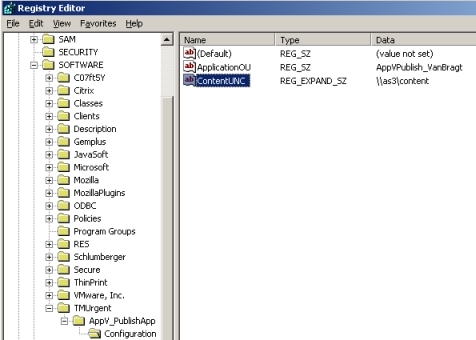 Next with an administrator account the AppV_Deploy.exe need to run and the packages should be added to the system. By default AppV_Deploying is using a GUI, where you add the packages one by one, but the executable supports parameters for scripting this part of the configuration. Finally the AppV_Publish.exe needs to be started when an end user logs on. A logon or group policy script is advised by TMurgent. The script checks which shortcuts should be published in the start menu of the end user. For troubleshooting purposes you can start the AppV_Publish with the parameter /D (displayed in the following figure) so all the steps are displayed. Most times a App-V specific error is displayed which can be used to troubleshoot the issues. Again two nice freeware utilities are published as add-on's on current App-V infrastructures. I think the Self Support App-V plug-in can be very useful in organization where users have a feeling for using IT products, while the App-V DeployNPublish can be used in specific infrastructures where the full App-V infrastructure cannot be used.